Ready to battle and to fly: supporters hold the new GPS flag high as the party’s new chapter begins in Sarawak. 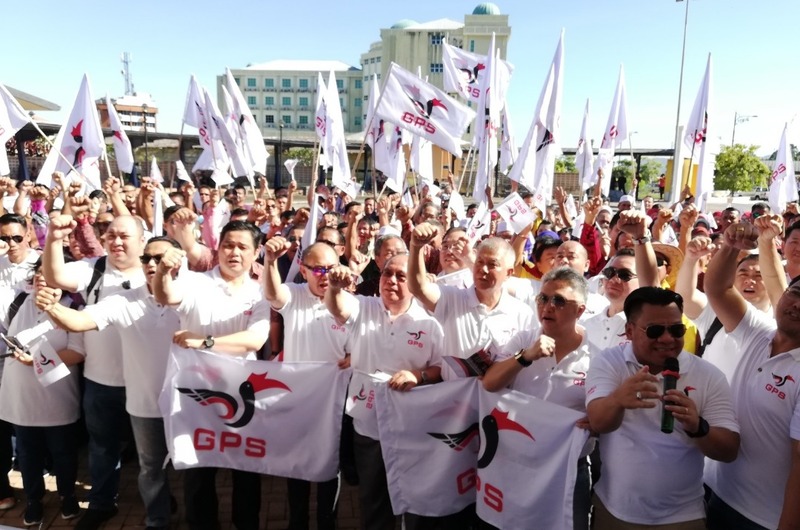 LAWAS: Gabungan Parti Sarawak’s( GPS) logo introduction into the state political scene on the ground has kicked off in Lawas. The introduction of the new logo is seen as a clarion call for a united front behind the leadership of GPS chairman and Chief Minister Datuk Patinggi Abang Johari Tun Haji Openg. Lawas MP Datuk Henry Sum Agong said the state leadership has placed the interests of the state and her people foremost and is always sensitive to the needs and aspiration of Sarawakians. He said this in his speech at Lawas Amphitheatre on Friday at the flag-off ceremony of the convoy carrying the GPS logo to create greater awareness of the post-BN era under GPS. Henry said the establishment of GPS is in the best interest of Sarawakians and provides focus in fighting for her rights and interests as the component parties are all Sarawak-based. He called on all the people in Lawas to be steadfast behind GPS in facing future challenges. The state-wide tour of the state was participated by leadership and of GPS Youth and Women sections of the component parties in Lawas, giving support to the mission as tour leader and GPS Youth leader Gerald Rentap Jabu lit the torch in Lawas . Also present were programme publicity chief and Piasau state assemblyman Datuk Sebastian Ting, deputy chairman of PBB Bukit Sari, councillor Awangku Jinal Abidin Pengiran Haji Jawa and respective chiefs of the Youth and Women wings of PBB, SUPP, PDP and PRS in Lawas. The launching of the logo will include a rally to start from different parts of the state, from as far as Lawas in the north to Telok Melano in the far south, and finally converging in Kuching on Jan 19 for the grand launching at Stadium. The entourage travel to Limbang and will reach Miri on the same day.